The video is actually titled, "Michael Palmer — Importance of Getting Stung" but he's not the first beekeeper to think that getting stung is important. 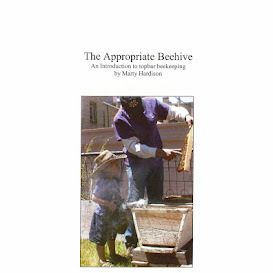 This is what my mentor and his decades of beekeeping experience have taught him. Beekeepers and more often their non-beekeeping family members can develop a sensitivity to bee stings by inhaling bee proteins. Not exposed to the actual bee venom, their immune systems do not develop a tolerance to stings, but the protein is close enough to develop an allergy. All that time I used to spend standing near my hives, breathing in the aroma — it's amazing — probably weren't good for me. In addition to my sting rate averaging less than one a year, my body was getting enough venom to activate my immune system but not enough to develop a tolerance. Marty once found his wife unconscious and later his son developed an allergy. If I recall correctly, his son went through VIT like me but Marty administered live stings regularly afterward. We've talked about my allergy a few times, and now that my allergist isn't in-network Marty is going to teach me how to administer in-the-field venom therapy. He's going to "back up a bee" to administer a sting. Instead of having to grab a bee by its wings, Don from buddhaandthebees.net told me about using duct tape to snag a bee but I'm an experiential learner and really need to see it done firsthand to feel confident that I'm doing it right. This month's injections are my last at the allergist, and then I need to be sting-free for 6-weeks before I can have my blood tested. If test results are A-OK, I'll have Marty show me as soon as he can after that. Michael Palmer says "t cells" in the video but he means g. IgG antibodies are protective antibodies, and IgE are allergic antibodies. I saw that video a couple of years ago, and it's changed the way I look at stings. Instead of being annoyed at being stung, I now view them as booster shots. I've even brainwashed, er, convinced my kids that stings are good. My daughter got stung this weekend, and in between sobs, she kept asking, "This is going to make me healthier, right?" I hope you document the process of administering your in-the-field therapy with photos. Please, be careful, though. Don't want you getting hurt (more than the pinch from the stinger). Wow, that's some food for thought! It will definitely change the way I think about stings! Now I'm worried about the children in my outyards - one more thing for me to worry about! This year, most of my stings have been on my hands since I've been going gloveless. While I don't like getting stung, I guess it's good for me. Unlike Julie, I'm usually as covered up as Mike Palmer! The worst part of getting stung (especially when you do it intentionally) is that a bee has to die. I really hope that the therapy works for you. I know it's been a long haul for you. Thanks for sharing your journey! @Don No more tank tops for me. :-( The Beests have driven me into a jacket & gloves. Even when not inspecting them, hundreds of those kamikazes will bomb me & then rile up whichever bees I'm working with. Never thought I'd say this, but I'm looking forward to a regicide. Not sure if you are interested in attracting swarms @Julie, but you can preserve those queens in alcohol and use the tincture as a lure.